The Star TUP900 Series has been discontinued. No direct replacement is available. The TUP900 Series printing solution brings the ultimate in flexibility and performance to kiosk printing. Its modular design eases integration with many different kiosk configurations. The looping presenter of the TUP900 ensures jam-free operation by eliminating user access to the document while it is printing. The presenter also allows for the capture of documents which are not removed by the user. Paper handling capabilities up to 6" diameter paper rolls (up to 10" with optional paper roll holder unit) with widths from 80 to 112 mm give the TUP900 Series ultimate paper flexibility. 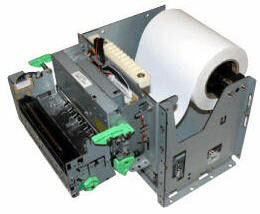 The large paper roll holder combined with the looping presenter ensure many hours of unattended operation. Direct thermal, Auto-cutter, Presenter. Requires Power supply (Part# 30781753) and Interface Board. See accessories.